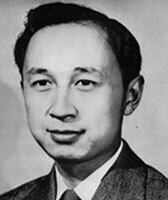 Qian Xuesen (Tsien Hsue-Shen) was a prominent Chinese aerodynamicist and cyberneticist who contributed to rocket science and established engineering cybernetics. Recruited from MIT, he joined Theodore von Kármán’s group at Caltech’s Graduate Aeronautical Laboratories, including the founding team of the Jet Propulsion Laboratory. Later, he returned to China and made important contributions to China's missile and space program. Shortly after arriving at Caltech in 1936, Qian became fascinated with the rocketry ideas of Frank Malina, other students of von Kármán, and their associates, including Jack Parsons. Along with his fellow students, he was involved in rocket-related experiments at GALCIT where he received his PhD in 1939. In 1943, Qian and two other members of their rocketry group drafted the first document to use the name “Jet Propulsion Laboratory.” Shortly after marrying in Shanghai in 1947, Qian returned to America to take up a teaching position at MIT and was granted a permanent resident permit. He answered "no" on an immigration questionnaire that asked if he ever had been a member of an organization that advocated the overthrow of the U.S. Government by force. This, along with an American Communist Party document from 1938 with Qian's name on it, was used to argue that Qian was a national security threat during the era of the second red scare. Despite that fact, in 1949, at the recommendation of von Kármán, Qian became the Robert H. Goddard Professor of Jet Propulsion at GALCIT. He applied for naturalization at that time, but could not obtain citizenship. Von Kármán wrote of Qian, "At the age of 36, he was an undisputed genius whose work was providing an enormous impetus to advances in high-speed aerodynamics and jet propulsion.” He worked on designing an intercontinental space plane, which would later inspire the X-20 Dyna-Soar, a precursor to the American Space Shuttle. Subsequently, Qian became the subject of five years of secret diplomacy and negotiation between the U.S. and China. He lived under house arrest and constant surveillance with conditional permission to teach without classified research duties. Qian received support from his colleagues at Caltech during his incarceration, including legal representation and a trip by President Lee DuBridge, who flew to Washington to argue his case. It was also during this time that Qian wrote Engineering Cybernetics which was published in 1954. The book concerns the practice of stabilizing servomechanisms. In 18 chapters it considers non-interacting controls of many-variable systems, control design by perturbation theory, and von Neumann's theory of error control. It was immediately reviewed as a major contribution to control theory. As one reviewer succinctly put it, "(it is) difficult to overstate the value of Qian's book to those interested in the overall theory of complex control systems." The travel ban on Qian was finally lifted on August 4, 1955 in exchange for the repatriation of American pilots who had been captured during the Korean War. He resigned from Caltech shortly thereafter, leaving Los Angeles aboard the USS President Cleveland. Navy Under-Secretary Dan Kimball, who had tried for several years to keep Qian in the U.S., commented on his treatment, "It was the stupidest thing this country ever did. He was no more a Communist than I was, and we forced him to go." Immediately upon his return to China, Qian began a remarkably successful career in rocket science, boosted by the reputation he garnered for his past achievements as well as Chinese state support for his nuclear research. He became the father of the Chinese missile program, which constructed the Dongfeng ballistic missiles and the Long March space rockets. He died in Beijing in October, 2009.